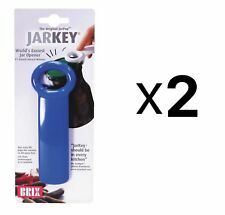 The World's Easiest Jar Opener, the Brix JarKey. The JarKey jar opener fits all traditional preserving jars. The JarKey is placed against the lid of the jar, and with a slight lift, the vacuum seal is released, and the lid can now easily be unscrewed. Constructed from a high-density ABS plastic, the jar opener has no sharp edges or points, no moving parts, and is extremely durable. Dishwasher safe. Available Colors: blue, red, white, or yellow ✷ colors are selected at random, we cannot accept requests for specific colors ✷ Made in Denmark. The Cutting Circular Blade is Sharp and Cuts inside. The Big Turn Knob is Easy to turn. Made of High Quality Stainless Steel but Lightweight, Corrosion- resistant, Safe. Copper Jar Opener. 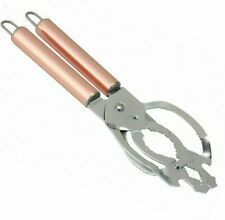 · Every household needs a good quality jar opener. · Makes light work of tight lids. · With bottle cap opener. · Dish Washer Safe. · Stainless Steel with copper finish handle. · It has a solid handle for a firm easy grip and easy use. Jarkey Jar Opener - Hand Held Lever Action Operation For Stubborn Lids. For soda pop or beer cans. No more broken nails trying to open beverage cans. Great for stewardesses, waitresses, bartenders etc. Makes a great gift. Actual colors are either red, green, or white. The multifunctional opener for every lid! Sturdy, plastic grip with stainless steel hanging loop - durable and easy to clean and dishwasher safe. Depth 2.0 cm. Norpro Can Punch / Bottle Opener. Construction: hardwood handle. Made in Taiwan. Nogent Super Kim Can Opener in Red. The sharpened cutter made of tempered steel stays sharp and opens cans of all sizes. Very compact, ‘Super Kim’ takes little space in a drawer or picnic basket. Suitable for use by right and left handed people. Jar Opener. 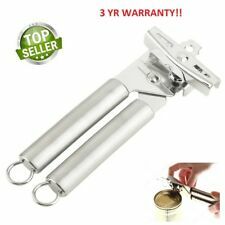 · Every household needs a good quality jar opener. · Makes light work of tight lids. · With bottle cap opener. · Dish Washer Safe. · It has a solid handle for a firm easy grip and easy use. Brix Original Jar Pop, the World’s easiest jar opener, pops the vacuum seal of jar lids so they spin open freely. Finally, open those stubborn jars in a single action! No more twisting or gripping and straining hands! Endorsed by arthritis associations worldwide. Simply place Jar Pop jar opener against the lid of the jar and, by gently lifting the handle, release the vacuum seal so the lid can easily be removed. Jar Pop is specially designed for simple and easy use by anyone, even kids or people with arthritis and carpal tunnel. There are no sharp edges or moving parts and it’s extremely durable. This go-to of kitchen tools is compact enough to store in the kitchen gadget drawer. Keep a spare in the garage, boat, camper, and anywhere a jar needs to be opened quickly and easily. Easy to use and dishwasher safe for easy cleanup. TRUSTED SELLER + MADE IN THE USA + QUICK SHIPPING!!! Kuhn Rikon’s sturdy plastic jar opener is the perfect tool for opening both smooth-sided and grooved caps and lid from 1-inch to 3.5-inches. The handle allows you to open the lid with ease thanks to the leverage effect. The grippers stay locked on lids and don't let go. Dishwasher safe. Norpro 597 Non-Slip Rubber Jar Opener makes it easy to open tough jars. Use the rubber jar opener to get a better grip and easily open even the toughest jars with less effort. Floral design. Sabatier Professional Aluminium Alloy Satin. Can Opener. Bottle Opener. Manual Can/Tin Opener. We aim to resolve any problem as quickly as possible. ® Can Openers are an exact copy of the originals that were first developed in 1942. Originally designed for and distributed in the K-ration, it was later included in the C-ration. They make a great addition to any camping trip or survival bug-out bag. Zyliss 5 In 1 Opener . .
No more worries about broken fingernails. 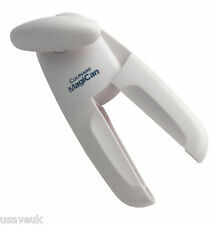 The Ring Pull Can Opener has a non-slip grip handle for added comfort. It is dishwasher safe and great for people with arthritis. Dishwasher safe. Weight: 0.13 lbs. Prepworks from Progressive 6-in-1 Multi Opener - Jars, cans, bottles and more. Size: 14 x 6.5 x 2.5cm. Not anymore with our Profile universal opener! With crown cap lifter and lid lifter. Easy to operate for even small hands, left and right. Plus anyone can use it since it's also suitable for people with small hands! Zyliss Safe Edge Can Opener . 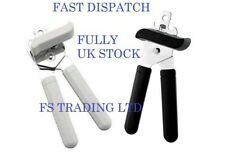 An Ultra Safe Can Opener|Opens cans from top, not side of can to prevent sharp edges on lids|Lid grippers safely remove lid for easy disposal|Rubber non slip handles provide a comfortable, secure grip|19 cm in length . Nogent Super Kim Can Opener Classic Design. Compact shape makes it easy to fit in any draw. 100% Made in France, classic design. Heavy duty can opener cutter is easy to use & a must have kitchen utensil. 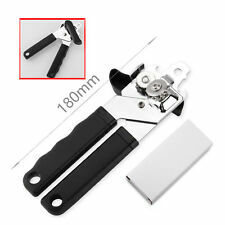 Heavy Duty Easy Grip Can Opener Cutter. 1x Can Opener Cutter. Nice Designed & Comfort Grip Handles. Material: Iron. Handle Material: Plastic. This can crusher can crush 8oz and 12oz aluminum cans for easy recycling. It is made of heavy duty steel construction with a high impact ABS handle. 12oz Wall Mounted Can Crusher. Punch Flange Tools. Can Opener, Two-Way Classic design can and bottle opener combination. Nickel plated finish. Can and bottle opener combination. Two-Way Can Opener. Features an extra sharp gear-driven, rust resistant blade with a durable over-sized non-slip plastic turning knob for a comfortable and sturdy grip. This nicely designed opener will make opening cans easy. Easily slide the hook under the tab and pull to open. Will open practically all ring pull cans including vegetable, soup, pet food, soda and more. KITCHENAID CAN OPENER BLACK NEW! HIGH-CARBON STAINLESS STEEL BLADE. EASY CRANK WITH OVERSIZED KNOB. HAND WASH ONLY. Bottle Opener. Standard classic Traditional design. One of the smartest & greatest invention of the army. Small & easy to carry around. Faster than a normal can opener if the user has experience. The can opener is a small folding blade used to open canned rations (such as K-rations or C-rations) among many other uses. US SELLER, VERY VERY HIGH QUALITY, FREE SHIPPING!!!!!!! Chef Aid Top N Lift Can Opener . White Plastic|Easy and Simple to use|Suitable for Left or Right Handed Use|A must have Kitchen Gadget|One of a Comprensive Range of Household Products from Chef Aid .